There are different methods to stop reservation but they requires a lot of hard work, strong determination, will power and the main thing is UNITY. If all of the Indians unite and fight against the reservation on the basis of caste. Then no power can stop us. Demanding for reservation free India is a very good thing. When India will be free from reservation on the basis of caste then there will be one category, unity and competition among all the Indians. Today reservation is killing the ability of a very intelligent person and differences among friends also increases. Due to this reservation a general category student is filled with negative thoughts that he can't get job, job is only for low category students etc. Which is very wrong. The question comes that IF WE DO NOT BELIEVE IN CASTE THEN WHY WE BELIEVE IN CASTE RESERVATION?? We should say BIG NO to the reservation. Then only India will progress and become a good country. Reservation is a curse which is making India hollow and one day it will break into pieces if this reservation system is not stopped. There are many rich who belong to low category and are still taking the benefit of reservation whereas there are many general category students who are poor and are not able to progress in their life due to reservation. 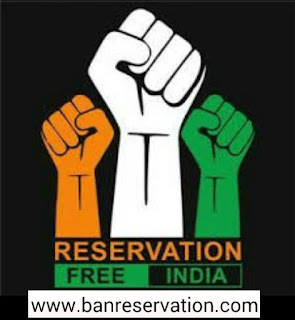 If this reservation system is not stopped then we are so near of the day when Indians will fight among themselves and then there will be only disunity. Today the voice of every general category student is reservation free India. THE RULES should be SAME for all. We are living in modern word and thinking is like of old people. IF YOU AGREE WITH ME THEN ADD YOUR SUPPORT SO THAT MORE PEOPLE CAN READ.